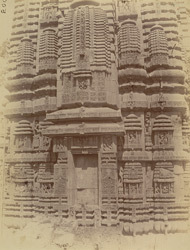 Photograph of the façade of the Brahmeshvara Temple, Bhubaneshwar from the Archaeological Survey of India Collections, taken by William Henry Cornish in 1892. The Brahmeshvara Temple complex (c.1060) stands within a walled enclosure with a principal temple and four smaller corner shrines. The sanctuary is roofed by a tall vertical tower while the mandapa has a solid pyramidal roof. The tower of the sanctuary has smaller tower-like structures on it. The outer doorway is decorated with guardian figures with foliation and scrollwork and a row of Navagrahas, the nine planets of Indian astronomy. The panels on the tower have sculptures of amorous couples and rearing beasts in the recesses between the wall projections. The temple is also noted for the sculptures of the differnt forms of Shiva and royal and saintly figures.